After the success of last year's trip, I will be returning to Uganda again this year. The highlight of the trip will be Shabbat with the Abayudaya Jews, a tribe in north-east Uganda that adopted Judaism 150 years ago. There are many tribes and groups around the world who consider themselves to be Jewish, and the question of “Who Is a Jew?” and “Where are the Lost Tribes of Israel” will be the central themes of this journey. Our visit to the Abayudaya will include a visit to local Jewish Schools, the local fair-trade coffee growers, Shabbat with the community and a local music festival. In addition, we will visit the source of the White Nile in Jinja, leaern about the offer to create a Jewish State in Uganda, enjoy a safari cruise along the Albert Nile on our way to the Murchison Falls (one of the great nature sites in Africa) and go chimpanzee trekking. There are many options to extend your visit including trekking to see mountain gorillas in the impenetrable forests in western Uganda. ​This is an experience not to be missed! Tentative Dates: 13-20 February 2019. To book your place - Click on the button below. Central Europe was the birthplace of Ashkenazi Jewry. Here, along the main trading rivers Jewish communities were established and Jewish life flourished. Many aspects of the Jewish life we take for granted today were first established here as the result of the influence of surrounding communities. This 8 -day (7- night) cruise takes us through the heart of Germany and many prominent medieval Jewish centres. We will visit Regensburg – home of R. Judah HaHasid the founder of Hasidut Ashkenaz, an early form of Jewish mysticism. Ashkenazi Jewish life first started to thrive in Mainz. Bamberg hosted one of the oldest Jewish communities in Germany, while Rabbi Meir of Rothenburg had an enormous impact on the Ashkenazi Jewish legal tradition. Nuremberg, the political home of the Nazis and the location of the War Crime Tribunals following the Second World War confronts us with the realities of modern Jewish history in Germany. All this with the luxury and convenience of the Amadeus Silver II, where we will benefit from comfortable accommodation, delicious meals and a full educational programme. Central Europe was the birthplace of Ashkenazi Jewry. Here, along the main trading rivers Jewish communities were established and Jewish life flourished. Many aspects of the Jewish life we take for granted today were first established here as the result of the influence of surrounding communities. 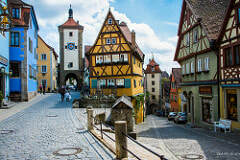 This 4-day (3 night) adventure takes us to the heart of Germany and many prominent medieval Jewish centres. We will visit Regensburg – home of R. Judah HaHasid the founder of Hasidut Ashkenaz, an early form of Jewish mysticism. Bamberg – a World heritage city with one of the best-preserved old towns and which hosted one of the oldest Jewish communities in Germany. In Nuremburg we will concentrate on modern Jewish history in Hitler’s Nazi marching grounds and we will also visit the site of the Nuremburg War Crime Trials. ​​To register your interest - Click on the button below.